It is a very business grade professional company that provides hosting services. It is a little different than other top hosting service providers as it exclusively targets business grade customers only. As they provide services for only one category, they ensure that their services offered are of high performance and are competitive. They offer great web hosting services. It focuses on business hosting services. So the company does not offer or provide any shared or budget type hosting services. Due to this, they have simple product lineups as well as they can provide great operational efficiency. They are also able to provide great quality of services to their clients. Also, the company does not provide shared hosting service plans as small businesses or individuals generally purchase these and this can affect the professional image of the company. The company provides great VPS hosting services for business-grade requirements for hosting. For a dual-core processor with 50 GB of SSD storage, 2 GB RAM and 3 TB of transfer bandwidth including 1 IP address, the plan starts at $19.95 per month. And the highest plan is for two core processor with 80 GB SSD storage, 4 GB RAM, 4 TB transfer bandwidth including 2 IP addresses, the cost is $39.95 per month. These plans are ideal for users who want performance and power of normally dedicated hosting but do not have a certain usage requirement. This helps customers who do not want to pay a significant amount for underutilized web services. By using their VPS hosting services, customers won’t need to compromise on performance anymore. Users can also change resource allocations to get the right amount of required resources and no overhead, but that depends upon site traffic and server load. 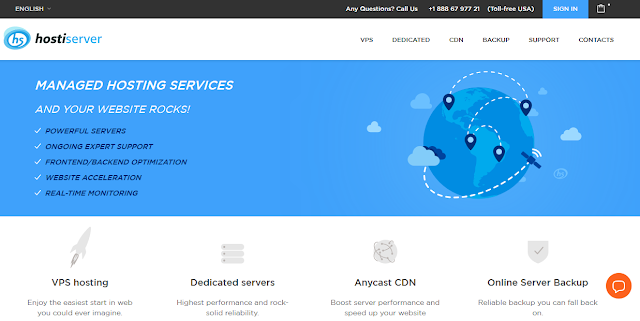 You can easily use the hosting service though you're not a tech savy guy. It's that easy to run your website on it with managed hosting service. In fact, you don't have to worry about the uptime, downtime, server load or how to configure it. You also get good tech support all the time. The customer care service is very professional and they will resolve your problems fast. Hostiserver is great for those businesses that require a dedicated server plan. The company has data centers in both Netherlands and United States due to which the users can choose the server location depending upon where the user expects more web traffic to originate. These dedicated hosting service plans are also available with add-on options of full server management and administration including special tech support. This provides sustained performance and increased reliability at highest levels irrespective of server load. Also with these add on the rebound time from any hardware or software failure is very quick as the fault gets identified very quickly and is corrected by an expert team of tech support team. Also, IPv6 servers come at no extra cost. Also, the MySQL databases get automatically updated which prevents data corruption when hardware fails. As the company is a business-oriented hosting service provider, so it doesn’t offer shared hosting plans. Hosting plans based on CMS like WordPress or Joomla perform well on their dedicated hosting and VPS hosting platform. WordPress is one of the most used CMS nowadays which powers many tops and highly trafficked websites. Numerous business and corporate clients also use it. WordPress platform is supported by it as well as all other services and add-on like plugins and extensions that work with WordPress. A customer can avail customer service of this hosting company through online ticketing service. Also, the customer service is fast and adequate as the client base of the company is only business targeted. They provide great technical support and customer service. They also provide dedicated customer or server management with a little extra cost for people looking for quick services. The company maintains an excellent uptime server status. The company has maintained consistent performance and speed and has faced very less service downtime. They deliver reliable and robust services throughout the year. They are also partner with Tier-I providers: Cogent, Hurricane, TATA, Level 3, Hibernia, GTT, etc to get maximum redundancy on all levels from the network providers to the rack. They also have N+1 redundancy of key systems and Custom designed security solutions. 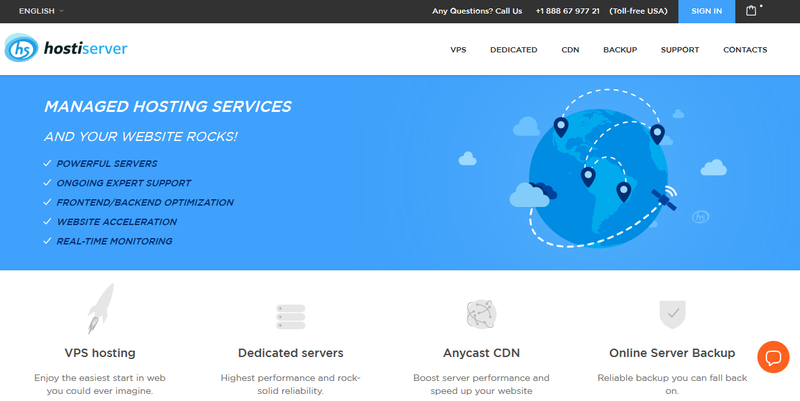 Considering everything it is a reliable server and is a great hosting services provider that aims to always provide great performance and speed alongside value for money offers. So, this was all about Hostiserver company review. I hope you enjoyed reading this review and got to know everything about it. Do let me know your views on that in the comments below. You can also subscribe for SolveMyHow newsletter to get latest updates on tech right into your inbox!